In the beginning was the Word, and the Word was with God, and the Word was God. The Word was in the beginning with God. All things were made through him. Without him was not anything made that has been made. In him was life, and the life was the light of men. John 1:1-4 NHEB. 1) Who and/or what is God's word? 2) What must I believe to be saved? 3) How can I evangelize my friends and family? This may be the most important Bible study offered on this site; but, it might not be what you would first think. You'll soon see, though, why a study of the nature of God's word, and the subject of evangelism, are so tightly interwoven. Knowing who and what God's word is, and how it relates to your spiritual life and well-being, is the most effective evangelism bible study available - bar none. The critical need for God's word is lost on most people, may I dare add, even most pastors. Yes, you heard it here first. Most pastors today do not stress personal Bible reading and study for members of their flock, which is dreadful. That dire circumstance will be targeted today, as you'll be given the knowledge to build your personal relationship with God, properly. For those of you with the spiritual gift of evangelism, who are always searching for the best way to witness, you've come to the right place. A study guide for knowing both who and what is God's Word is powerfully effective in your pursuit to save souls. Why? Because if a person doesn't believe God's Word, how on how earth can they believe in God (Romans 10:17). This works. Give it a try! As easily discerned from John 1:1-4 above, Jesus Christ is the Word of God (also see Revelation 19:13). Jesus has many different names in the Scriptures for many different reasons. But his title as The Word of God can be reasonably argued as his greatest name. Let's look at some of the reasons why. 1) Prior to referring to Jesus as The Word of God, John stated that Jesus Christ was pre-existent, i.e. "In the beginning..." Jesus has always enjoyed a continual existence, face-to-face (John 6:46), with God the Father, with one exception when he hung on the cross, forsaken (Matthew 27:46). In other words, Jesus has always been God's only begotten Son (John 1:14). No other being can claim, or will ever claim, such an elite position and presence with God. 2) The term "word" comes from the Greek logos, meaning: a) an expression of thought; and, b) embodying a conception or idea. So, in this context, the being of Jesus Christ is the personal expression of the thoughts of God's mind. 3) Furthering that biblical idea, Jesus is the living conduit of God's deepest thoughts and expressions towards the universe. Jesus is basically equivalent to a verbal extension of God's mind in reference to Creation. Jesus, in essence, is the Mastermind of the Universe. Jesus is indeed the second of the three members of the Godhead (John 10:30). 4) God's mind is the ultimate source of all intelligence, truth, goodness, love, etc; making Jesus the purveyor of ALL good things known in our universe. So far as we're concerned, ALL of the universal wisdom, knowledge, truth, and love is found in Jesus Christ alone (John 8:31-32). 5) Jesus Christ, as the Word of God, created the entire universe ex nihilio, i.e. out of nothing (John 1:3). God gave his Son the authority and power to speak all of creation into existence (Hebrews 1:1-2). God's words are so powerful that they created matter when the commands went forth through nothingness. Genesis 1:1-3, and in fact, ALL of Genesis chapters 1 & 2, is the true account of Jesus' verbal expression of the manifestations of God's thoughts of creation. 6) Adding to his work, Jesus created all of life, including you and me. First John 1:1-2 tells us that Jesus, named here "The Word of Life," created all biological life, including humanity. 7) Finally, Jesus Christ, as the Word of God, also grants people eternal life (i.e. if they hear and obey his gospel). Apart from Jesus, no one receives everlasting life with God (John 5:24). Jesus shared, "It is the spirit who gives life. Human effort accomplishes nothing. The very words that I speak to you are spirit and life" (John 6:63). The Word of God is Jesus Christ. He is the revealed Word of God's deepest thoughts, most importantly concerning us and our salvation. Are you starting to understand the importance of this lesson for the sake of effective evangelism? God has given all communications between him and us over to Jesus. The times that God speaks to us about the matters of salvation, his thoughts come through Jesus Christ, or one of Jesus' designated agents. We've now discovered that the Word of God is Jesus Christ. But that's not all - here's some more exciting news for you: God's Word designates something else. Let's find out exactly what that is. Jesus Christ states in Mark 8:38, "If anyone is ashamed of me and of my words in this adulterous and sinful generation, the Son of Man will also be ashamed of him, when he comes in the glory of his Father with the holy angels." The two things represented by the term, "Word of God," are both involved in this frightening statement by Jesus. We've already learned that Jesus is the Word of God, but now he tells us that his "words" are equal with him. In other words, Christ's words are just as hallowed as he himself is. That amazing knowledge obviously begs the question, "What are Christ's words?!" We have to know, so that we can obey, right?! Exactly. John 7:16 says, "Jesus therefore answered them, "My teaching is not mine, but his who sent me." He then added, "For I say only what I have heard from the one who sent me, and he is completely truthful" (John 8:26b). Christ's words are God's words (also see Revelation 1:1). Jesus Christ tells us exactly what God wants us to know. Remember, Jesus is the Word of God who verbally announces God's thoughts and intentions. Psalm 138:2 KJV will now abruptly change your perspective on the Bible. The Lord says through David, "I will worship toward thy holy temple, and praise thy name for thy lovingkindness and for thy truth: for thou hast magnified thy word above all thy name." Oh my! Did you catch that last part?! Read it again. Have the tremors in your heart slowed down yet? It's true - God places his word above, or at least alongside, his Son's throne. Shockingly, suddenly, we have the responsibility to know God's word, because it is as holy, righteous, and alive as he is. That's right, God's word is alive. Hebrews 4:12 NIV states, "For the word of God is alive and active. Sharper than any double-edged sword, it penetrates even to dividing soul and spirit, joints and marrow; it judges the thoughts and attitudes of the heart." Jesus wraps this teaching up in a clear, unequivocal statement, "He who rejects me, and does not accept my words, has one who judges him. The word that I spoke, the same will judge him in the last day. For I spoke not from myself, but the Father who sent me, he gave me a commandment, what I should say, and what I should speak. I know that his commandment is eternal life. The things therefore which I speak, even as the Father has said to me, so I speak." John 12:48-50 NHEB. The Word of God, then, is also Jesus' words, which are every bit as eternal, wise, good, and loving as he is. God Almighty places these two things, Jesus and his words, side-by-side, wielding the same authority. The Word of God is Jesus; and, Christ's words are God's words. Get it! Got it? Good. But, there's more! Jesus' words are found in the Bible, usually printed in red. Now, I don't know about you, but the words in red always grab my attention. But, should Christ's words in red be viewed as more important than the words in black, i.e. the prophet's and apostle's words? Let's walk through the different areas of the Bible and discover the importance of the Bible's black words. 1) The Pentateuch, the first five books of the Bible, i.e. Genesis - Deuteronomy, was written by Moses. Jesus tells us exactly how he views Moses' words in Mark 10:3,5, "What did Moses say in the law about divorce? He wrote this commandment only as a concession to your hard hearts." 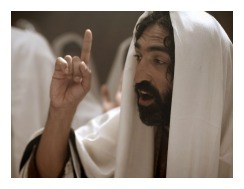 The Bible tells us God's fingers wrote the Ten Commandments, but Jesus here attributes them to Moses. This reveals the intimate relationship God has with his appointed Bible writers. Jesus took them as his own words (also see John 5:45-46). 2) The Historical Books, i.e. 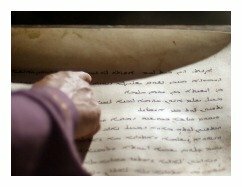 Joshua - Esther, are the Bible books accounting for much of the history of the nation of Israel. They're represented by Jesus' quote of Joshua 22:5, "The first is, 'Hear, Israel, the Lord our God, the Lord is one: you shall love the Lord your God with all your heart, and with all your soul, and with all your mind, and with all your strength. 'The second is this, 'You shall love your neighbor as yourself.' There is no other commandment greater than these" (Mark 12:30-31 NHEB). Jesus also accepted these books as his own word. 3) The Wisdom Literature, i.e. Job - Song of Songs, includes the books and proverbs of various authors. Jesus proves they are considered part of God's Holy Word, as well, quoting them here in Mark 12:35-37, "Jesus responded, as he taught in the temple, 'How is it that the scribes say that the Messiah is the son of David? David himself said in the Holy Spirit, 'The Lord said to my Lord, 'Sit at my right hand, until I make your enemies the footstool of your feet.' David himself calls him Lord, so how can he be his son?' The common people heard him gladly." Jesus taught that the Holy Spirit breathed the words into King David (also see Hebrews 4:7). Jesus claimed these words, as well. 4) The later Prophets, i.e. Isaiah - Malachi, represented here by Isaiah, are likewise held as the highest authority by Christ. Listen to Jesus verify his Prophet's words as God's words: Mark 7:6-9 says, "Well did Isaiah prophesy of you hypocrites, as it is written, 'This people honors me with their lips, but their heart is far from me. But in vain do they worship me, teaching as doctrines the commandments of men. For you set aside the commandment of God, and hold tightly to the tradition of men.' Full well do you reject the commandment of God, that you may keep your tradition." Even though Jesus was lambasting the Jewish Talmud, he revealed how Isaiah spoke God's actual words; and he claimed them as his own. 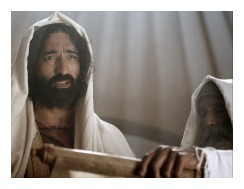 5) The Apostles, who wrote the entire New Testament, i.e. Matthew - Revelation, are authorized by none other than Jesus Christ. 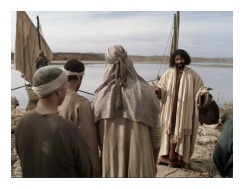 He commanded his apostles to teach the Word with full authority, backed by his power. 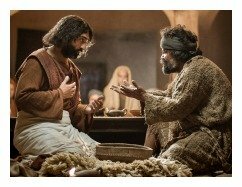 For instance, he tells Peter, "So, when you have repented and turned to me again, strengthen your brothers" (Luke 22:32). He told Ananias about Paul, "Go, for Saul (aka Paul) is my chosen instrument to take my message to the Gentiles and to kings, as well as to the people of Israel" (Acts 9:15). Jesus then told Paul directly, "Don't be afraid! Speak out! Don't be silent! For I am with you" (Acts 18:9-10). Finally, but not comprehensively, he told his apostles upon his ascension to heaven, "Teach these new disciples to obey all the commands I have given you" (Matthew 28:20). Jesus assured his apostles that they were empowered and enlightened to share his words by the power of the Holy Spirit, "When the Spirit of truth comes, he will guide you into all truth. He will not speak on his own but will tell you what he has heard... The Spirit will tell you whatever he receives from me" (John 16:13,15). Denying God's ability to reveal and write his word through the human instruments of the prophets and apostles is denying the Holy Spirit, which promises eternal condemnation. Yes, blaspheming the works of the Holy Spirit, including the inspiration of the prophets and apostles, is unforgiveable (Matthew 12:30-32). There is NO WAY around the biblical fact that the writings in the Holy Bible are direct words from God. All of the Bible's words, from Genesis 1:1 through Revelation 22:21, are God's holy words to those whom he loves (John 17:6-8). Accepting this fact is essential for accepting the being of God, through Jesus Christ alone, which includes his mercy, love, and forgiveness. In summary, the Word of God is Jesus. Christ's words are God's words. But every bit as important, the prophet's and apostle's words are Christ's words, and therefore the Word of God. Those who listen and follow these words will live forever (John 5:25). And, Christ's words cannot be altered in any way (John 10:35); nor will they ever pass away (Mark 13:31). The Bible is truly God's Word which is holy and eternal, and which will judge your very soul (John 12:48-50). The secret is now out for why this is an evangelism Bible study - One must believe that God's Word is both Jesus Christ and the Bible. The majority of people on this earth do not accept this most essential fact about God. In case Jesus' words fall onto deaf ears (e.g. John 10:25-26), please consider more Scriptural teaching about the Holy Bible. Some of the most powerful words taught by Jesus' apostles come through the pen of Peter. Listen to him speak of God's word, "We have the more sure word of prophecy; and you do well that you heed it, as to a lamp shining in a dark place, until the day dawns, and the morning star arises in your hearts: knowing this first, that no prophecy of Scripture is of private interpretation. For no prophecy ever came by the will of man: but men spoke from God, being moved by the Holy Spirit" (2 Peter 1:19-21). Revelation 1:1-2 gives us great insight into all of those who "wrote" what we know as the Holy Bible. "This is the Revelation of Jesus Christ, which God gave him to show to his servants the things which must happen soon, which he sent and made known by his angel to his servant, John, who testified to God's word, and of the testimony of Jesus Christ, about everything that he saw." There seems to be a misdirected, dangerous movement amongst "Christians" that casts doubt upon the entirety of the Bible being God's complete word. This hunch is simply a take on people with whom I communicate. Notice how the humble Luke opens his gospel, "Having traced the course of all things accurately from the first, to write to you in order, most excellent Theophilus; that you might know the certainty concerning the things in which you were instructed" (Luke 1:3-4). Paul adds immensely to this critical teaching in 1 Thessalonians 2:13, "Therefore, we never stop thanking God that when you received his message from us, you didn't think our words as mere human ideas. You accepted what we said as the very word of God - which, of course, it is. And this word continues to work in you who believe." Second Corinthians 2 finds Paul having to defend himself, "Now God uses us to spread the knowledge of Christ everywhere, like a sweet perfume... You see, we are not like many hucksters who preach for personal profit. We preach the Word of God with sincerity and with Christ's authority, knowing that God is watching us" (2 Corinthians 2:14-17). Do you feel the necessity, based upon these apostle's words, that a belief in the entirety of Scripture is tantamount to believing the gospel of Jesus Christ for salvation? If so, you're correct! You see, it's a test for us. Can we as humans believe that an almighty, omniscient, omnipresent, loving God can use actual humans to convey his words to those whom he loves? BAM! There's the test for you. There's a test for your faith. Let me explain. Mark 9:49 informs us that we'll be tested with fire. Our biggest and first test is this: Do you believe that the Holy Bible is absolutely true, being the very words of God? A negative answer to that test question is a total failure of faith. Flunking this test displays that the person swallowed the lies of Satan and his agents in full. He's believed Satan's greatest lie. Satan's first and most powerful deception is casting doubt on a human's belief in God's Word. This happened in the Garden of Eden (Genesis 3:1,4-5). He later tempted Jesus to have doubts about God's Word at the Temptations of Christ! (Matthew 4:1-11). Jesus corrected Satan with the most important words you'll ever hear, "People do not live by bread alone, but by every word that comes from the mouth of God!" (Matthew 4:4). Reflect on that statement a moment; then read John 6:57-58. Eve bit into Satan's lie and swallowed it whole; while Jesus refused the same. Eve failed; Jesus prevailed. Eve led us all into sin (Romans 5:12); Jesus led some of us out of sin (Romans 5:15-16). Whose model will you follow: Eve's or Christ's? There it is, my friend. Do you believe God's word, meaning every single word found in the Bible? Is God's Word the ultimate and absolute source of ALL truth? Will God's Word lead you to eternal life? Stop looking around for other people to answer these life-or-death questions for you. Look into a mirror; and then return and tell God your answers. Now that we've let God's Word witness to itself, what does it all mean? What is the use of God's word? What do we do with God's word? 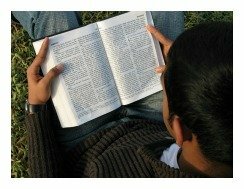 St Paul the Apostle tells us clearly what to do with God's Word in 2 Timothy 3:16-17, "All Scripture is God-breathed and profitable for teaching, for reproof, for correction, and for instruction in righteousness, that the man of God may be complete, thoroughly equipped for every good work." Does that describe you and the habits of your life? Do you want to be a man or woman of God? Are you reading, studying, and applying the Bible to your life? Have you been doing good works for God's glory? Are you helping promote the Scriptures to others? Hear, further, Paul's next words, "I command you therefore before God and the Lord Jesus Christ, who will judge the living and the dead, and by his appearing and his Kingdom: proclaim the word; be urgent in season and out of season; reprove, rebuke, and exhort, with all patience and teaching" (2 Timothy 4:1-2 NHEB). We have the responsibility to know the Scriptures, reading and studying for ourselves and also for the good of others (John 15:13). We need to lay down our worldly lives, dying to our sinful desires, so that others come to experience the Word of God. That's God's message to us - we must respond. Acts 16:14 shows how God begins a good work within each of us (Philippians 1:6). Listen to Lydia's story, "A certain woman named Lydia, a seller of purple, of the city of Thyatira, one who worshiped God, heard us; the Lord opened her heart to accept the things which were spoken by Paul. When she and her household were baptized, she begged us, saying, 'If you have judged me to be faithful to the Lord, come into my house, and stay.' So she persuaded us." Have you accepted the things said by Jesus and his prophets and apostles? Has God really opened your heart, so that you can understand the words of Jesus, Paul, and Peter; and John, James, Mark, Luke, Matthew, Moses, David, Job, Jonah, Jude, and all the other Bible writers? Has the light clicked on in your mind? In your heart? (Luke 24:45). Have you fallen to your knees upon meeting God? (Acts 9:4). That's what you're instructed to believe in; but further, you must believe in every word spoken in the Bible about Jesus Christ (John 17:17-19). The Bible is the story of Jesus Christ our Creator, Sustainer, Lord, High Priest, and Savior. We each have to hold God's Word as the highest authority in our lives. We discern life through the Scriptures. Our lives must become shaped by what we read in the Bible. We hold what every human says up to God's standard in the Bible. We test all things by God's word (Acts 17:11-12). We must build a biblical worldview in our lives. We should interpret life as God would desire. He wants us to understand life like he does (1 Corinthians 2:16). We must allow the Bible to help us think like Jesus thinks, and act like Jesus acts, and serve others as Jesus did so altruistically. Philippians 2:5 states, "In your relationships with one another, have the same mindset as Christ Jesus." Paul, once again, lays out the entirety of Scripture as the Word of God, "But I make known to you, brothers, concerning the Good News which was preached by me, that it is not according to man. For neither did I receive it from man, nor was I taught it, but it came to me through revelation of Jesus Christ" (Galatians 1:11-12 NHEB). It is totally impossible to be saved, or to be a real Christian, if you disbelieve the Bible's place as equal with God (remember Psalm 138:2 KJV). Denying the Bible is a denial of the One whose words are written therein. Think of the saying, "A man is only as good as his word." God accepts the responsibility of that truth; and holds you accountable for believing it in regards to your relationship with him. Not believing his word is equal to not believing him. Ignoring your duties to read, study, live, and promote the Word of God also ignores God himself. If that's your story, step away from Satan and his lies. Repent of being duped. Repent of your selfishness and life of sinful rebellion. Fall at Christ's merciful feet and ask for forgiveness. "Then you will shine among them like stars in the sky as you hold firmly to the Word of Life" (Philippians 2:15-16). Don't ever let go of Christ or his Word! Jesus said, "He who is of God hears the words of God. For this cause you do not hear, because you are not of God" (John 8:47). Become "of God" dear friend. Join our (click): Sinners Prayer. Ask a question about the lesson here. 1) Why is denying the Bible equally as bad as blasphemy of the Holy Spirit? (see 2 Peter 1:19-21 & Matthew 12:30-32 & John 16:7-8,13-15). 2) What does Eve and Christ share in common in regards to God's Word? (see Genesis 3:1-4 & Matthew 4:1-11; Romans 5:12-19). 3) Explain in your own words the fact that the Bible's "black" words of the apostles are as authoritative as its "red" words directly from Christ. When people do not accept divine revelation, they cast off restraint; but he who keeps the law is happy! Proverbs 29:18 NHEB. Let your hand be ready to help me, for I have chosen your instructions. I have longed for your salvation, LORD. Your Law is my delight. I have wandered away like a lost sheep. Come and find your servant, for I have not forgotten your commandments. Psalm 119:171-176 NHEB. Paul says, "I'll give you all the proof you need that Christ speaks through me. Christ towards you is not weak, but is powerful in you. For indeed he was crucified through weakness, yet he lives through the power of God. For we also are weak in him, but we will live with him through the power of God toward you. Test your own selves, whether you are in the faith. Test your own selves. Or do you not know as to your own selves, that Jesus Christ is in you? - unless indeed you are disqualified. But I hope that you will know that we are not disqualified. I'm sorry for ever doubting that you have the power to speak to me through your Word. I now know both Jesus Christ and the Bible are your Word. Thank you so much! You truly give me everything needed to live a rich, honorable life that brings you glory. Thank you for Jesus. Thank you for the Bible. Thank you for the Holy Spirit to enlighten me! Use me to show this great truth to others. Keep me in your arms, Lord. In Christ's name, Let it be so. Share on Facebook below and click for your Free Printable Bible Lesson: Evangelism Bible Study Guide. Special Note: I'm grateful to Big Book Media & Free Bible Images, stock.xchng, Morgue Files, and Stock Photos For Free for the use of their photos for the Evangelism Bible Study Lesson.